Donald Trump’s election was unique to history on many fronts, not the least of which that he is the first Republican to win the presidency who didn’t have big support from Bohemian Club’s elite since William Howard Taft became their man in 1908. Just ask Mitt Romney and John McCain, who also failed to win over the Bohemian contingent. 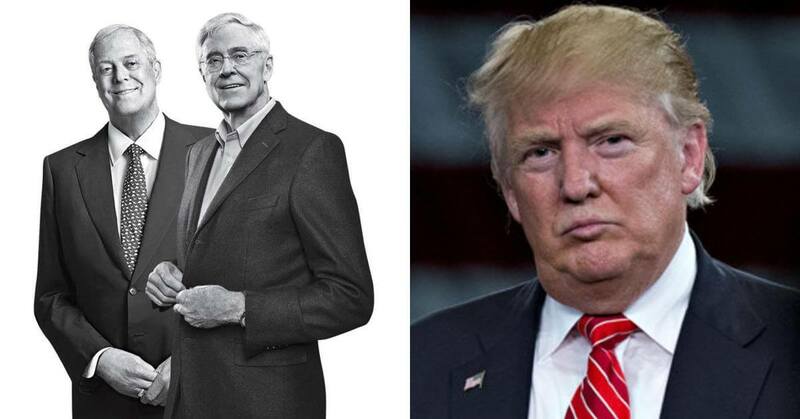 During the primaries, Trump was shunned by Koch money– a likely funnel of major dollars from fellow Bohemians. We don’t know for sure because donations to Koch and other PACs were made secret by the Koch shepherded Citizens United. Money and other campaign resources, like voter data were given to Bush, Cruz, Rubio and other candidates not so set on breaking up the ruling elite’s hold on politics as usual (Trump’s Tweet on their trip to California to ask for Koch help: “I wish good luck to all of the Republican candidates that traveled to California to beg for money etc. from the Koch Brothers. Puppets?”). Trump won the primaries, anyway, but in the general election, almost a billion dollars of Koch money went to support down-ticket candidates and initiatives. Trump had to get elected on his own dime, and made independence from Koch/elite money part of his campaign. Trump is said to have a cordial relationship with David Koch–they have neighboring mansions in Palm Beach, Florida—but he owes him nothing. And Trump’s inelegance is said to be a turn off to the genteel tycoon, as is the threat of more “tax and spend” policies like Trump’s promise of major infrastructure spending. A reported wrench in the Koch machine, however, is that some of these Republican political operatives took shelter under Koch’s employ when the GOP was out of power. Now that they are back in power, it seems they are not so gung-ho on the pure Koch Libertarian agenda. A divided right is not a bad thing, no? On the foreign relations front, we saw the mountain go to Mohammad this May when Henry Kissinger, the Grand Wizard of Bohemia, paid a visit to the Trump White House. Almost exactly a year earlier, candidate Trump had paid a visit to Kissinger at his home after visiting another Bohemian Secretary of State, James Baker. Trump came away from that meeting stared down by a Kissinger rebuke of his proposed immigration ban, Kissinger himself an immigrant made good. This meeting, he and Kissinger reportedly talked about peace in Syria. That and perceived similarities between the Nixon and Trump administrations ate up most of mainstream media’s reports on the meeting. But, given his role as one of the major sculptors of the post-WWII international power arrangement, both overt and covert, particularly in Europe, Russia, the Middle East, and China, plus Kissinger and Associates’ financial ties with China since he helped open up its markets, there were likely cautionary words about maintaining a delicate balance with the markets and China, recognizing delicacy is not a Trump strong suit. And that is the main rub. Under the rule of the power elites, a delicate china shop (pun intended) has been built upon treaties, markets, side agreements, secret agreements, proper protocol and recognition of one’s social station. Trump is almost universally recognized as being “unfit for the job”, except for that 30-odd percent of people who still believe he represents their vision: a welcome departure from rule by Harvard trained lawyers, financiers, politicians and the liberal media, trying to simplify processes of power made opaque by the elites’ urge for secrecy. Secrecy means nothing to Trump, as evidenced by his Twitter account and ongoing feuds with his intelligence agencies. That could be a good thing; secrecy is the life blood of the elites, the right information no one else has can lead to millions! Secret back room deals are far from new in DC or business. Dropping the cloak of secrecy around American politics and foreign policy could help dislodge nests of filth that have been allowed to gather in its hidden corners of arms deals, psy ops, black ops and promises that would likely make most Americans shudder to know were being made on their behalf. I could see advantages to encouraging Trump on openness if it weren’t for his dismissive attitude to truth. With help from Breitbart News and our own bombastologist, Alex Jones’s war on the Bohemians, accusations of “fake news” and promotion of alt-right disinformation have undermined truthful dialogue. With different stories dribbling out from press conference to press conference and a press secretary hiding in the bushes, Trump’s Tweets might be the best thing about his presidency. You want transparency? Don’t let it intimidate you. The current angst over Russian meddling in elections also echoes long standing hysteria over the Russian Threat among Bohemians dating back at least to the Depression. Bohemians J. Edgar Hoover and Richard Nixon, among others, ran the offensive against Communism starting soon after the Second World War. Bohemian Grove encampments must be about as anti-Communist as you would expect from any group of 2000 of the drunkest and wealthiest Capitalists in the world. Trump seems entirely clueless on the subject, maybe a good thing. So should Bohemian Grove Action Network see Trump as an ally? Or is he just replacing one type of elite with another, more plutocratic, less oligarchic? Alex Jones taught us with his buffoonery that not every enemy of my enemy is my friend. And Trump’s proposed goal is to put a load more money in to the pockets of these men, so it’s a win-win for them because he is such an easy scapegoat if things go wrong. There will likely be many unintended consequences; may they all be good ones.